Once you have lived with a dishwasher it is very hard to go without one, dishwashers are a great way to hide a mess in the kitchen fast. If you are feeling time poor because of a broken down dishwasher we will be happy to send a technician to save the day. Most dishwashers will last 10 – 15 years without too many problems providing they are not abused. When I say “abused”, leaving items on plates like toothpicks, bread ties, rubber bands and other foreign objects will cause problems with your machine. These items will most likely make it past the filters and lodge in pump impellers or spray arm jets. This can cause the low powered motors to burn out or produce very poor wash results. Often people buy dishwasher cleaners as advertised on TV to try and rectify the poor wash results caused by the obstructions, this is like shutting the gate after the horse has bolted. These dishwasher cleaners will remove limescale buildup and fatty deposits but it will not clean filters or remove blockages. Filters and blockages will need to be cleaned manually. There have been cases where clients have put caustic drain cleaners in their dishwasher to try and get the machine to drain the water out, this will rarely work. The dishwasher hoses and seals are not designed to handle these harsh chemicals but worse than that the client rarely informs the technician that they have done this until the technicians hands are burning from the chemicals. 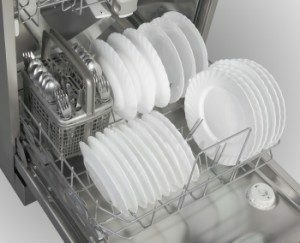 If your dishwasher will not drain out remove the filters and bail out as much water as possible before the water sours. If you have not found the cause of the problem once you have removed as much water as possible you will need to contact us for service. Is there power to the dishwasher (plug something else into the power point to test it)? Have you cleaned the filters thoroughly? Do the spray arms hit on plates or utensils? Are the jets in the spray arms blocked with pips or plastic? Have you ran a cleaner through the dishwasher? Are the hoses kinked behind the the machine or in the cupboard? Have you switched off and back on, if a computerized machine to reset the computer? Call us to help to get your dishwasher running again.